My initial efforts here were to prepare a blueberry tart, even though blueberries are not in season in the dead of winter. As you may have realized, I love colorful foods and love almost all fruits and vegetables, so when I saw that I could buy what appeared to be good blueberries, I couldn't resist the urge, even though they were twice as expensive as they would be on a balmy July day. 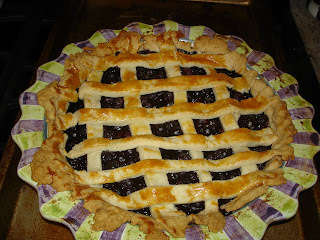 If you are looking for my blueberry pie recipe, with its decorative lattice, click here. 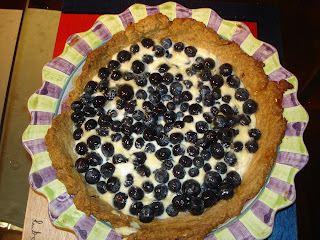 In addition, I remembered when I was ready to prepare the blueberry tart, that I did not yet have a tart pan (something every good baker should have, and that I plan to rectify before summer berry tart season is upon us). Thus, I adapted the original Martha Stewart recipe from the Everyday Food website for a blueberry cream pie. It may look like a pie, rather than a tart, but it was every bit as delicious, judging from how quickly it has disappeared from my refrigerator. Combine the flour and sugar in the artisan mixer, and add butter until the mixture resembles a meal. Beat in the eggs and ice water, until the mixture forms a dough. Roll out the dough into a pie crust and fit into a pie pan (or a tart dish). Refridgerate until chilled for 30 minutes. Then, bake the shell alone at 375 for about 40 minutes, until lightly browned, using pie weights. Place the milk, vanilla bean (cut lengthwise) and 4 T of sugar in a medium saucepan over high heat and cook until almost boiling. In a separate bowl, whisk the egg yolks, 1 T sugar and cornstarch together. The resulting mixture will be very thick. Remove and discard the vanilla bean, and slowly pour the milk mixture into the egg mixture, whisking the entire time. Do this last step over medium high heat, until it thickens substantially for about 1-2 minutes. Don't do it too long, or it will dry out and burn. Next, beat the heavy cream with 1 tsp of sugar, using the whisk attachment of your mixer for several minutes, until the mixture has changed form and resembles whipped cream. Fold this into the egg/milk mixture. Add the thick, creamy mixture to your pie shell and top with the blueberries. Glaze with some melted quince jam, using a pastry brush. The pie (or tart) should be ready to eat, although you can chill it first, if you prefer. Note that I do not prepare a lattice for this type of blueberry cream pie, like I do with my more conventional blueberry pie (pictured below). If you would like to enjoy the pie with a glass of wine, I would recommend doing so with a late harvest risling, or perhaps a Canadian ice wine. Perhaps the fact that I prepared this recipe at all, in January, shows how much I miss summer fruits in the winter, and how the cold weather has been getting to me over the last couple of weeks. Does this go against my acclaimed farm to table approach? Not really - because the recipe is certainly meant to be prepared in June or July, using fresh farmers market blueberries.